At Lacamas Dental, we cannot stress enough the importance of taking care of your smile. Not only will you enjoy better oral health, but you will enjoy more confidence when you can smile without regret. It doesn't matter what age you are, what walk of life you come from, or what other circumstance you might be in at the moment, good oral hygiene is the best way to practice preventative dentistry. By having good oral hygiene when you are not at the dentist's office, and seeing your dentist on a regular basis, you can avoid dental problems that so many other people have to face. As you are saving your gums and your teeth, you will find yourself saving time and money as well. Floss your teeth at least once a day. Bacteria likes to hang out between the teeth where it can't get brushed away. When you floss, you are getting rid of the bacteria that hid from the toothbrush between teeth and under gums. Each day, brush your teeth twice with a soft toothbrush and toothpaste. This will remove the food and the plaque from the surface of your teeth. To further eliminate bacteria, brush the top of your tongue as well. Eat healthy, balanced meals. When you need a snack, reach for those healthy snacks, such as raw fruits and vegetables, cheese, and plain yogurt. Visit the dentist at regular six month intervals to get your teeth cleaned and x-rayed. Talk with the dentist about sealants for your back teeth. The sealants fill in the crevices of the back chewing surfaces where decay seems to start most often. If you play sports and your teeth could get damaged, wear the proper protection, such as a mouth guard. It is possible to have some tooth decay happening right now and not even realize it. Some cavities do not actually hurt, which is why it is important to visit the dentist every six months. While you are at your check up, the dentist will look for those spots of decay. Tooth decay isn't something that is specific to one area of a tooth. It can start on any portion of a tooth. When the dentist finds tooth decay, the cavity will be cleaned out and filled with a restoration so that it will not continue to spread. Gum disease, or periodontal disease, causes a major portion of tooth loss in many adults. Gum disease doesn't typically hurt the patient, which is why it could be hard to detect on your own. When you visit the dentist at your regular check up, your gums will be checked and measured so that the dentist can determine if you have gum disease or not. Plaque causes gum disease, which attacks below the gum line where the attachment of tooth to tissue is damaged. The sulcus (or the V-shaped crevice linking your gums and teeth) then progresses, becoming a pocket. When the infection gets worse, the pocket gets deeper. There are two major stages of periodontal disease. Gingivitis. At this point in the disease, it is still possible to reverse the problem and even eliminate it all together. The gums will typically be red and swollen and could possibly even bleed quite easily. By brushing twice a day and flossing at least once a day, you can take care of gum disease at this stage. Periodontitis. The gums and bones surrounding the teeth become severely damaged at this stage of the disease. Your teeth can fall out or be in such bad condition that the dentist will have to remove them to save your mouth. Some medications, including drugs for epilepsy, oral contraceptives, steroids, and drugs that deal with cancer. Having a bridge that does not fit correctly anymore. Diabetes and other diseases that affect the entire system. Continuous bad breath or a constant bad taste in your mouth. Gums that are separating from your teeth. Pus coming from the gums between your teeth. Dentures that will not fit anymore. Permanent teeth that are moving or loose. Healthy Gums. The gums and the bone surrounding the teeth hold the teeth securely in place. Gingivitis. Gums that bleed easily and are red, swollen, and sensitive. Periodontitis. Plaque that remains intact becoming tartar, and causing the gums to pull away from the teeth. Advanced Periodontitis. The gums continue to pull away, causing destruction to more and more of the bone surrounding the teeth. Teeth, whether healthy or not, can begin to fall out or require an extraction. By practicing good oral hygiene and taking care of your teeth, you can live with healthy gums, which is plenty of cause to smile. A good toothbrush. You need to replace your toothbrush if the bristles fray. Typically, you can keep a toothbrush for three or four months, but if it frays sooner than that, you should replace it. Dental floss. You can buy a spool of floss, or you can use other interdental cleaners. There are multiple flossing tools, such as brushes and picks. Talk to the dentist to make sure you are using them correctly. When you are shopping, look for products that contain the American Dental Association Seal of Acceptance. This tells you that the product is safe and will be effective to use. 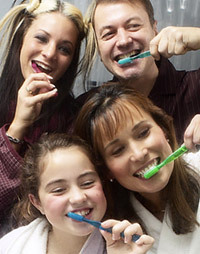 Remember that by practicing good oral hygiene, your smile can be attractive and healthy too.